You've heard of duck season. You've heard of rabbit season. But who's heard of crab season? While we're borrowing from the likes of traditional hunting, our catch requires no guns or camo clothing. Venture off the beaten path with us as we hunt down soft shell crabs... a tasty treat that is only available for a few weeks out of the year. 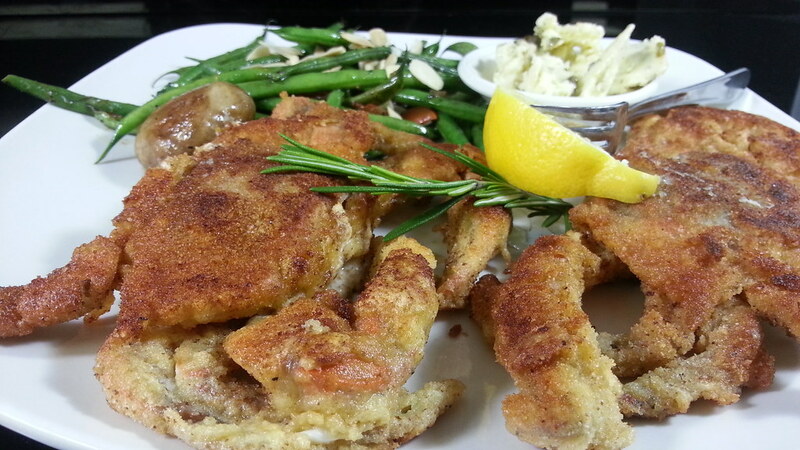 For a short time, you can get your hands on two soft shell crabs sauteed in garlic herb butter. For those of you who've had crab before, this is something a little different. Soft shell crabs are blue crabs that have recently molted their exoskeleton and are still soft. What many people don't realize is that the entire crab can be eaten. This means that there is no peeling and cracking of shells; the entire thing can be easily cut and eaten with a knife and fork. Because of this, we offer a disclaimer and instruct our servers to ask our customers if they've ever eaten these crabs before. We don't want anyone to feel dissatisfied if they try to crack the shell. Considered a delicacy across the world, these are prized crabs that are limited in hunting season to avoid over fishing. They are also the freshest crabs (they come to us still alive), so rest assured that even the Midwest can enjoy the finest that the Atlantic and North Pacific have to offer. With this new found knowledge, I strongly urge you to use this article as a cheat sheet. Even if you have never had soft shell crab before, maybe this will help you to impress your server (she's not going to know anyway unless you tell her). And on top of that, you get a worldwide delicacy that's only available a few weeks out of the year! While I can't guarantee this will be around for long, I can assure you it's a dish not to miss!